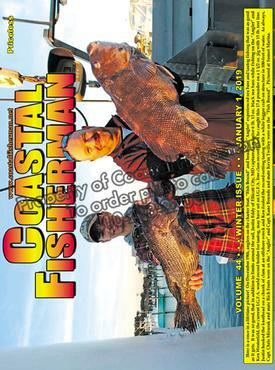 Following is a summary of the Fishing Reports in each weeks issue of the Coastal Fisherman. Issue dates are in bold. May 2, 2018 - the early season was plagued with bad weather, delaying the start for many anglers... tautog have dominated the action so far... Ron McClelland caught a 23 lb. 9 oz. tog on the “Fish Bound”with ocean temps around 44 degrees... short tog were caught along the rocks in the West Channel... mako sharks regulations increased the minimum size from 54-inches to 83-inches... flounder fishing in the bay just started to pick-up, primarily in the Thorofare... short flounder were found in the south bay... short stripers were caught around the Rt. 50 and Rt. 90 Bridges... mostly skates in the surf in addition to small stripers and some black drum... In Delaware - inlet temps are still in the upper-40s... short stripers were hooked in the IR Inlet only during the outgoing tide... good size black drum in the surf... a couple of flounder were caught in the Lewes Canal. May 9, 2018 - slow trolling over the Thorofare flats produced some nice catches of flounder... anglers on “Reel Vibrations” jumped off a mako at the San Gil... good size tautog continued to be caught in 75 to 100-feet of water... a few keeper tog were caught along the rocks in the West Channel... chopper bluefish were caught around the South Jetty and off the Oceanic Pier... no stripers off the beach on Assateague... water temp in the bay at the end of the outgoing tide was up into the high 60s... flounder were also caught near the “Hole in the Wall”... In Delaware - black drum dominated action in the surf... small stripers and bluefish were caught off the jetty in the IR Inlet... VFW Slough and Massey’s Ditch produced a few keeper flounder... bluefish were caught off 3 R’s Road... black drum were caught from the beach at Herring Point and Broadkill Beach in addition to Conquest and 3R’s Road... Water temp in the Lewes Canal moved into the upper-50s producing some flounder bites... tautog were found at the Outer Wall. May 16, 2018 - water temp in the bay was in the upper 60s... Thorofare flats was top spot for flounder fishing... mainly short flounder in the bay behind Assateague... improved bluefish action around the bridges... keeper tautog were caught at the South Jetty and the Rt. 50 Bridge... tautog action was good on ocean structure in 45 to 75-feet of water... small stripers were caught around the bridges and South Jetty... no stripers in the surf, only skates, bluefish and an occasional black drum... VA barrier islands produced catches of good size red drum... In Delaware - Sheila Stohler caught a 9 lb. 13 oz. flounder on DE Bay structure... the black drum bite heated up at the Coral Beds... keeper striped bass were caught at night along the rocks in the IR Inlet... a lot of shad were found in the IR Inlet mixed in with small bluefish and stripers... there was a strong tog bite on ocean structure 10 miles off coast. May 23, 2018 - weekend was a washout... striped bass were caught in the suds off Fenwick Island... the first mako was caught and released at the Sausages... sea bass season opened on May 15th... big tog were caught at the African Queen and on structure in 50-feet of water before the season closed... Thorofare flats continued to be the best spot for flounder fishing... slow trollers outfished drifters... bluefish were caught in the OC Inlet and during the incoming tide around the Rt. 50 Bridge... surf fishing was slow with only a few stripers, bluefish and black drum being caught. May 30, 2018 - the “Marli” graced the cover with a 93-inch, 291 lb. mako caught in 30 fathoms, south of the Marine Electric... the first yellowfins, dolphin and bluefin tuna were caught in 1,200 fathoms outside the Poor Man’s Canyon... first thresher was caught at the Fingers... first bigeye was caught in 770 fathoms in the Poor Man’s... several tuna were caught in 300 to 500 fathoms in the Baltimore and Poor Man’s Canyons... a few makos were released outside Massey’s Canyon... sea bass fishing was better on structure south of the OC Inlet than for those who ventured north... disappointing surf action with some black drum, a few stripers, bluefish and sharks... dirty water hampered flounder fishing on the Thorofare flats with Gulp and minnows being the top producers... some flounder were caught in the bay near the duck blinds... In Delaware - Susan Krepshaw caught a 44 1/2-inch striper in the IR Inlet... larger striped bass showed up in the surf along with some black drum and bluefish... flounder were still being caught in the Lewes Canal but weakfish and small stripers showed up also... good black drum action at the Coral Beds but the better bite was at Brandywine Lighthouse and in the suds off Broadkill Beach... sea bass fishermen struggled... larger stripers showed up for anglers fishing off the end of the IR Inlet Jetty... chopper bluefish were caught at the top of the tide in the surf near the Indian River Inlet. June 6, 2018 - Anglers on the “Fish-Full Thinking” won the Mako Mania Tournament with a 644.9 lb. thresher shark caught at the Cigar that would have been a new MD state record but it was shot... bluefish were caught at the Fingers... “under” bluefins were caught in 30 fathoms at the Hot Dog and Elephant Trunk... yellowfins were scarce, but a few came from the south end of the Poor Man’s Canyon... a couple of bigeye tuna were caught in the Washington and Norfolk Canyons... sea bass fishing was good this week on both ocean wrecks and natural bottom... the better flounder bite was in the bay behind Assateague near the duck blinds... water temp hovered around 66-degrees... surf action continued to be slow with only a few stripers and bluefish being caught... In Delaware - the surf saw better striper action but was dominated by sharks, kingfish and puffers... Tony Travatello caught a 45-inch striper in the Fenwick surf... water temp in the IR Inlet was 67-degrees... the first weakfish was caught in the IR Inlet... dirty water made flounder fishing tough... The Ditch gave up small stripers... flounder fishing in the Lewes Canal improved for anglers fishing with squid, minnows and Gulp... black drum fishing was still excellent at the Coral Beds. June 13, 2018 - yellowfin and bigeye tuna were caught in good numbers in the Baltimore and Wilmington Canyons... “Boss Hogg” jumped off a blue marlin in the Wilmington Canyon... the first longfin tuna was caught in the Baltimore Canyon... sea bass fishing was decent with anglers finding flounder mixed in on ocean structure... the first sheepshead of the season was caught at the South Jetty by an angler on the charter boat, “On the Run”... flounder fishing was good if you could find clean water and was definitely better in the bay behind Assateague near the duck blinds... small bluefish, stripers and shad were caught around the Rt. 50 Bridge... In Delaware - the IR?Inlet produced catches of shad, bluefish and stripers... some flounder were caught in the Inlet by the Coast Guard Station... headboats reported slow flounder action on ocean structure but decent catches of sea bass and large sea robins... 23 to 26-inch stripers were caught in the Fenwick Ditch... kingfish dominated surf action... flounder fishing in the Lewes Canal turned on with bigger fish in the 22 to 23-inch range... the black drum bite at the Coral Beds slowed down. June 20, 2018 - anglers on the “Foolish Pleasures” caught a 636 lb. mako shark while fishing at night in the Norfolk Canyon... Ron Bennett released the first white marlin of the season on June 13th... the first blue marlin of the season was caught on “The Chaser” in 500 fathoms between the Baltimore and Poor Man’s Canyons... tuna fishing was exceptional in 200 to 500 fathoms between the Baltimore and Poor Man’s Canyons... golden tilefish were caught while deep dropping in the Baltimore Canyon... weakfish were caught at the South Jetty... sea bass fishing was tough with anglers having to deal with a lot of throwbacks to get their keepers... flounder fishing was much improved with the better action coming from the bay behind Assateague... a few short cobia were caught in the OC Inlet over the weekend. June 27, 2018 - anglers on the “Double Trouble” boated a 235 lb. bigeye tuna in the Baltimore Canyon... yellowfins were snapping in the Baltimore Canyon... small dolphin were caught on the troll in the Baltimore Canyon... several white marlin and a couple of blue marlin were caught and released in the Poor Man’s Canyon... the flounder bite was on the upswing, both in the bay and on ocean structure... the best flounder bite in the bay was behind the OC Airport... the first croakers of the season were caught in the Thorofare... a few weakfish were caught at the South Jetty on Gulp... anglers on the “Get Sum” caught an 8.5 lb. spadefish behind Harbor Island and a couple of short cobia in the Inlet... all the small bluefish you wanted were around the bridges... surf fishing was very slow... In Delaware - flounder fishing was good on the Old Grounds... sea robins were uncharacteristically thick on inshore structure... sea bass were hit-or-miss with the best bite coming from the Del-Jersey-Land reef site... flounder fishing was better in the Lewes Canal... spot showed up in the Rehoboth Bay... kingfish were snapping in the Delaware surf... short stripers were caught in The Ditch... headboats out of IR reported better flounder fishing than sea bass fishing on ocean structure. July 4, 2018 - white marlin and blue marlin were snapping in less than 100 fathoms between the Washington and Norfolk Canyons... big red drum were caught and released at the Bass Grounds... the yellowfin bite was strong, coming from the Baltimore and Poor Man’s early in the week and moving south to the Washington Canyon by the weekend... bigeyes were also caught in the Washington... larger dolphin were hooked in 150 fathoms in the Washington Canyon... a 39.5 lb. dolphin was caught on the “PYY Marine”... several makos were released in all the canyons with water temps in the low 80s... water temps in the bay were as high as 83-degrees... flounder were caught in the deeper, cooler holes... bluefish were caught around the South Jetty and the bridges... larger choppers were at the Hambone... sheepshead were found in decent numbers around the jetties... stripers were caught at night in the West Channel. July 11, 2018 - heavy storms rolled through the area over the weekend and kept most boats at the dock... flounder fishing on ocean structure during the week was outstanding for anglers using squid and cut bait... flounder fishing in the bay was good before the storm with the best catches coming from the bay behind Assateague... on the inshore shoals, anglers found triggerfish, Spanish mackerel, snapper bluefish and flounder... white marlin were really biting in the Washington Canyon and a number of blue marlin were hooked by junior anglers... tuna fishing was disappointing with water temps at 81-degrees with no breaks... bluefins were caught in 30 fathoms outside the Hambone... sea bass fishing was not good... tilefishing was good in the Baltimore Canyon early in the week for anglers fishing with squid... In Delaware - before the weekend storms, flounder fishing in the IR Inlet and Lewes Canal improved with limits for anglers fishing with white Gulp Swimming Mullets... in the IR Inlet, stripers were caught at night and a couple of weakfish were hooked as well... Fenwick and Isle of Wight Shoals produced catches of king and Spanish mackerel and snapper bluefish... better flounder fishing was 8 to 12 miles off the coast... surfcasters caught kingfish, sharks, rays and bluefish... stripers were biting on eels in The Ditch... the Cape Henlopen Pier produced croakers, snapper bluefish and flounder. July 18, 2018 - Sam Thorpe on the “Playmate” caught a 144 lb. bluefin in Massey’s Canyon to win the OC Tuna Tournament... anglers on the “Marlin Gale” hooked 5 blue marlin and a white marlin in 200 fathoms between the Washington and Norfolk Canyons... the yellowfin bite centered at the Washington Canyon in 100 to 300 fathoms... most of the yellowfins were in the 35 to 55 lb. class... bailer dolphin were caught in all the canyons with larger bulls coming from the Washington... Mike Lowe released a sailfish in the Washington Canyon... cobia started to show up in larger numbers on inshore lumps and around the African Queen... headboats found poor sea bass fishing so they flipped to a better flounder bite... red drum were caught by surf fishermen on Assateague Island... the best bay flounder bite switched to the deeper holes in the East Channel, along the docks of Harbour Island and around the South Jetty... In Delaware - the flounder bite in the Lewes Canal was improved, but not red hot... triggerfish showed up in good numbers at various DE Bay reef sites... inshore lumps produced catches of Spanish mackerel, triggerfish, kingfish and spadefish... Site 10 was a good flounder fishing spot... bluefish turned up in the Fenwick surf... flounder were caught in the IR Inlet along the Coast Guard Wall... croakers showed up in the Inlet along with some snapper bluefish... sheepshead and triggerfish were caught at Fenwick Shoal... headboats found flounder snapping in 80-feet of water. July 25, 2018 - big bluefin tuna were mixed in with yellowfins in Massey’s Canyon and around the Hambone... flounder fishing continued to be strong in the bay, especially in the East Channel and on ocean structure... most of the flatties were in the 17.5 to 19.5-inch range... anglers fishing the Bass Grounds returned with good numbers of big flounder... white Gulp Swimming Mullets continued to be the top flounder bait... spot and croaker were found around the Rt. 90 Bridge with chartreuse Fishbite bloodworms being the best bait... cobia showed up around Little Gull and Great Gull Shoals... several wahoo were caught in the Washington Canyon. August 1, 2018 - anglers on the “Reel Tight” won the Big Fish Classic with a 404.5 lb. blue marlin... it was a slow week for tuna fishing with windy conditions most of the week... bluefins and yellowfins were caught in Massey’s Canyon and around the 12 Fathom Lump... larger yellowfins came from the Spencer and Wilmington Canyons... blue marlin were hooked in the Wilmington Canyon... anglers caught swordfish in the Baltimore and Norfolk Canyons... a few wahoo were boated in the Wilmington, Washington and Norfolk Canyons in addition to a 71 pounder caught in Massey’s Canyon... inshore wrecks produced good triggerfish bites all week... In Delaware - cobia were found off the coast of Bethany... croakers, flounder and short stripers were caught in the IR Inlet... kingfish continued to dominate the surf... king and Spanish mackerel and bluefish were all caught on trolled spoons... headboats found good triggerfish bites on ocean wrecks... the flounder bite in the Lewes Canal was steady and spot increased in size and numbers... DE?Bay reef sites produced flounder, triggerfish, sea bass and weakfish... short stripers were caught in The Ditch on eels... flounder and triggerfish were snapping at Russell’s Reef. August 8, 2018 - the White Marlin Open started this week with 382 boats competing for over $5,461,000... President Trump sent a shout out on Twitter to Ocean City for all the boats flying Trump flags... white and blue marlin were caught in the Baltimore Canyon, outside the Poor Man’s Canyon and in the Washington Canyon... bailer dolphin continued to be caught wherever boats were chasing tuna... flounder fishing improved on inshore structure with the best bites coming in 80-feet of water... a 12 lb. barracuda was caught at the Jackspot... triggerfish were still plentiful at Fenwick Shoal... flounder, small stripers and sheepshead were caught at the South Jetty... in the bay, flounder were caught in the East Channel, Thorofare and the West Channel... 160 anglers competed in the Ocean Pines Flounder Tournament with a 21 1/8-incher taking first place... stripers were caught at night in the West Channel. August 15, 2018 - Pascual Jimenez on the “Weldor’s Ark” won the White Marlin Open with an 83 pounder worth $2,584,260 in award money... 702 white marlin were released in the tournament versus 385 in 2017... “Auspcious” weighed an 881 lb. blue marlin caught outside the Wilmington... “Buckshot” caught a 75.5 lb. yellowfin to win over $900,000, a tournament record for tuna... “Viking 72” won Top Release Boat with releases of 10 white marlin and a blue marlin... flounder fishing in the bay continued to be hot in the East Channel... inshore flounder fishing was better than in the bay with good catches coming from the Bass Grounds, Russell’s Reef and the Old Grounds... Chris Clasing caught a cobia in the West Channel... In Delaware - John Burbage solidified his standing as the best angler in his family by setting the new Delaware state record for cobia with a 79.4 pounder caught off the coast of Bethany... cobia showed up in good numbers off the coast of Fenwick and Bethany where anglers found them under schools of bunker... most of the better catches of flounder came in from around “B” Buoy and the Old Grounds... croakers showed up at the south side of the Indian River Inlet... anglers also found short stripers mixed in with shad and bluefish in the Inlet... the striper bite in The Ditch improved with fish in the 30-inch range caught on live eels... headboats fishing inshore structure struggled with a large number of short flounder. August 22, 2018 - lady anglers on the “Absolut Pleasure” won the Poor Girls Open with 12 white marlin releases in 700 fathoms between the Baltimore and Poor Man’s Canyons... Nancy Kohl on “A Salt Weapon II” caught a 112 lb. yellowfin to win the Tuna Division... deep droppers had great results on blueline and golden tilefish in the Poor Man’s Canyon... the Jackspot produced king and Spanish mackerel... the flounder bite on inshore structure remained strong... the winner of the Paradise Grill Flounder Tournament ventured all the way up to the coast of NJ to catch the 9.8 lb. flattie... a couple more cobia were caught off the coast of Delaware... sheepshead were found around the South Jetty... the East Channel and the Fish Bowl were the top spots for flounder... In Delaware - flounder fishing in the IR Inlet was spotty... cobia continued to be caught off the coast of Bethany and Fenwick on live eels or bucktails tipped with cut bait... croakers were found by headboats fishing 2 to 5 miles off the coast... action in the Lewes Canal tapered off with water temps in the low 80s... croakers were found on many DE Bay reef sites. August 29, 2018 - anglers on the “D.A. Sea” went 2 for 5 on bigeyes in the Baltimore Canyon to win the Tuna Division in The MidAtlantic Tournament, winning over $571,000... 55 blue marlin were hooked in the tournament... 1.73 billfish per boat/per day were hooked... “Billfisher” caught 6 bigeye tuna during their 3 days of fishing in 1,000 fathoms outside the Baltimore?Canyon... wahoo were caught at the Jackspot including a 72 pounder... flounder were snapping at the Old Grounds, Russell’s Reef and the Great Eastern Reef... the OC Reef Foundation dropped cement block #22,000 on one of their reef sites... anglers trolling at the Jackspot found, mackerel, mahi, false albacore tuna, bonitos, bluefish and even a barracuda... a 252 lb. thresher shark was caught at “A” Buoy... the throwback ratio for flounder in the bay was extremely high... sheepshead continued to be caught around the South Jetty. September 5, 2018 - the “Buckshot” released 23 white marlin and a blue marlin during their 2 days of fishing outside the Rockpile in the Marlin Club Labor Day Tournament... boats venturing up to the Hudson Canyon experienced an incredible white marlin bite, but closer to home the best bite was outside the Poor Man’s... several blue marlin were caught and released in the Poor Man’s and Washington Canyons... a 150 lb. bigeye was caught in the Poor Man’s... dolphin were caught in good numbers in the Washington Canyon... wahoo were captured at the Rockpile... Capt. Monty on the headboat, “Morning Star” reported the best flounder bite of the year while fishing in 80-feet of water on inshore structure... flounder fishing was good under the Rt. 50 Bridge... snapper bluefish and small stripers were caught around the Rt. 50 Bridge... sheepshead continued to be caught at the South Jetty including a 15 lb. 5 oz. bruiser by Dan Kous on the charter boat, “On the Run”... In Delaware - the flounder bite was scattered in the IR Inlet... bluefish were plentiful in the Inlet... surfcasters outside Indian River caught bluefish, spinner sharks and even a pompano... bluefish were thick on Fenwick Shoal... it looked like the bigger flounder moved out of the Lewes Canal... DE Bay reef sites gave up kingfish, croaker and bluefish... a good flounder bite was found at Sites 10, 11 and at the Old Grounds but larger flounder and some sea bass were caught at the Del-Jersey-Land reef site... dolphin were snapping in the Poor Man’s... surf fishing off the beach on Fenwick Island was good for kingfish, spot, bluefish and pompano...sea bass were caught at the Bass Grounds... black drum were spotted at the Haystacks. September 12, 2018 - weekend weather was ugly... cobia finally worked their way south to the inshore lumps off Ocean City... prior to the bad weather, flounder fishing in the East Channel was good, but the better bite was found directly under the Rt. 50 Bridge... flounder fishing at the Old Grounds produced the best catches of the week... the white marlin bite in the Hudson Canyon was so good several Ocean City boats made the 157 mile trip... the “Makara” ended up going 50 for 78 during their 2 days of fishing... a few wahoo were caught at the Hot Dog and in the Washington Canyon... In Delaware - the IR Inlet was loaded with snapper bluefish... striped bass were caught at night from the jetty rocks... decent size spot were caught in the back bays... bluefish showed up in good numbers in the surf outside Indian River... at Fenwick Shoal, anglers found 10 to 12-inch bluefish and Spanish mackerel... headboats started to search further offshore as flounder migrated east into 100-feet of water... the Lewes Canal produced catches of croaker and flounder... one angler caught 8 pompano in a single day while fishing off The Point... most of the flounder caught on inshore spots came from around “A” and “B” Buoy where they also hooked into some mahi... triggerfish, sheepshead and small black drum were caught at The Wall. September 19, 2018 - windy and rainy weather from the effects of Hurricane Florence put a damper on fishing this week... before the storm, boats headed to the Poor Man’s Canyon where they found good dolphin and white marlin fishing... bad weather forced flounder fishermen to stay around the Rt. 50 Bridge with fresh bunker being the bait of choice... boats looking for ocean flounder had to travel further offshore into 100 to 120-feet of water to find good size fish. October - December, 2108 - This fall was disappointing. It was one of the windiest, rainiest falls most can remember and it really put a hurting on fishing. Don’t get me wrong, the fish were snapping. You just couldn’t get out there to get them. The fall sea bass bite has been excellent, and as you saw on the cover of this issue, the bite on December 19th was incredible. Everyone who ventured out on the headboats, “Angler” and “Morning Star” caught their limit and Justin Eddy captured the fish of a lifetime when he boated a 6 lb. 13 oz. knothead on an offshore wreck. The tautog bite was really heating up as you can see in the pages of this issue with several big bruisers caught on ocean hot spots. On December 19th, Ken Westerfeld, who is the current all tackle I.G.F.A. record holder, set a potential line class record when he hooked a 17.4 pounder on 15 lb. test line. We haven’t seen a fall bluefish run within 4 miles of the beach in 5 years. You used to be able to count on battling choppers at Fenwick and Isle of Wight Shoals in October and November. Not anymore. In early November, we saw a good swordfish and bigeye bite between the Poor Man’s and Baltimore Canyons. Anglers on the charter boat, “Reel Chaos” went 12 for 21 on swordfish and caught a 66-inch bigeye that was estimated at 200 lbs. As this report is being written towards the end of December, we are still patiently waiting for stripers to show up in numbers inside of 3-miles off the Delmarva coast. Warm water temperatures kept them north off of the Jersey coast for an extended period of time and schools were located cruising south, 9 to 11 miles off the Ocean City coast. Not helping matters is that local ocean temps are plummeting, down to 43-degrees at presstime. Anglers will look back on 2018 with great memories of excellent fishing and lets all hope that 2019 will be just as good or better.